While there are many tens of thousands of books in print about starting and running a traditional capitalist business, very few books have been published specifically about starting and running a worker-owned business, and those books that have been published tend to be relatively old. 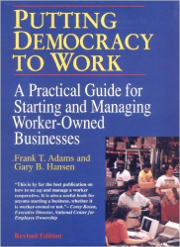 Previously, I reviewed the worker-ownership guide, We Own It, that was published in several editions back in the late 1980s/early 1990s, and here I would like to take a look at another guide from around that same era, Putting Democracy to Work, A Practical Guide for Starting and Managing Worker-Owned Businesses, by Frank T. Adams and Gary B. Hansen. Both these business guides were written in a very different time and for a very different business environment, before the age of the internet and before the hyper-capitalist, neoliberal economic model completely conquered the world. When these two guides were first published, the Soviet Union was still with us, and the final revised edition of Putting Democracy to Work from 1992 would have been written shortly before the end of the Cold War. But as I argued in my review of We Own It, I believe that even though much of the specific information in these guides is now outdated, the general advice they offer is still very valuable, and that they are definitely worth tracking down and reading if you are considering launching your own worker-owned start-up. Putting Democracy to Work is a thick book, but even at 324 pages it feels brief, and that is probably inevitable. There is simply so much ground to cover — you couldn’t really set up a business based on the business plan outlined in chapter 4 for instance; you would need much more specific guidance, but Putting Democracy to Work does flag up those issues particular to worker-owned businesses. In this way, Putting Democracy to Work would serve as a valuable complement to topic-specific business guides aimed principally at capitalist entrepreneurs. Socialist entrepreneurs would still need to read general guides — on writing business plans, for example — but could then supplement that research with the worker-ownership specific advice in Putting Democracy to Work. When it was published, one of the best things about this book would have been the long list of contacts in the appendix for groups in each US state that helped start-ups, but of course, most of this information is now obsolete. Also, like We Own It, Putting Democracy to Work is very much aimed at a US audience, and would be less relevant to businesses in other parts of the world, in the details anyway. But it is more in the broad strokes that Putting Democracy to Work is valuable. The authors have years of practical experience with worker-owned businesses, and their advice on the special challenges that face a new worker-owned business is well worth the effort required to sort through the sections that wouldn’t apply. The heart of this book is in chapters 8 and 9, “Managing Worker Democracy” and “Democracy on the Workfloor”. It is workplace democracy that really distinguishes the day-to-day operation of a worker-owned firm from the command-based organization of a capitalist firm. This is the sort of advice that you could only find in a start-up guide like this, one that is specifically targeted at worker-owners. This guide addresses a number of questions that only worker-owners have to face, such as: Practically, how do you make business decisions democratically as a group of worker-owners? How are worker-owners hired, and if needs be, how are worker-owners laid off (made redundant) or even fired? How do worker-owners locate capital to start up and to expand? And critically, how do successful worker cooperatives like the Mondragon cooperatives structure their businesses to generate their own sources of capital? And so on. Putting Democracy to Work doesn’t offer a blueprint of a perfect worker-owned firm, but it does explore the key differences and particular difficulties of setting up and managing a worker-owned business, and it offers comprehensive advice on how workers can design an administrative structure for their start-up that will be both democratic and successful. As as a complement to more topic-specific (but capitalist) business guides, both Putting Democracy to Work and We Own It are invaluable resources for socialist entrepreneurs. Definitely worth buying and reading, despite their age. Putting Democracy to Work: A Practical Guide for Starting and Managing Worker-Owned Businesses. Frank T Adams and Gary B. Hanson, 1992, Berrett-Koehler Publishers.